Google's auto-complete feature is useful if you're not sure how to formulate your query, but it's very important how you start your search. A post from reddit compared the suggestions for queries that start with "when was" vs. "in which year was" or "why" vs. "for what reasons". The suggestions for the formal question were fewer, more detailed and more fact-oriented. Compare "for what reason must seats in congress be reapportioned every 10 years" with "why men cheat". In fact, most of the formal questions are copied from school assignments. 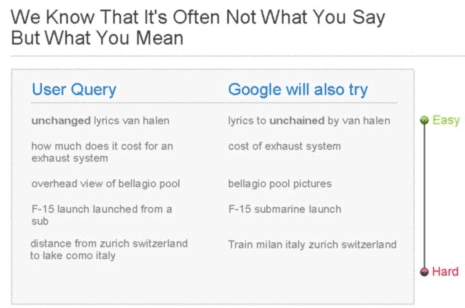 As one of the reddit users noticed, "the stupid column suggests actual phrases most people will type into a Google search. The intelligent column suggests high school or college homework, mid term, finals and research questions typed verbatim as seen on the assignment." Google has improved the way it handles questions, but it's still a better idea to reformulate your queries and replace "for what reasons" with "motivation" or "cause", "when does twilight come out on DVD" with "twilight DVD release date", "in what way did ernest rutherford contribute to our understanding of the atom and its parts" with "ernest rutherford contribution atom". Whether you copy a question from a school assignment or you are really curious to find some information, type short keyword-rich queries in Google's search box. The rephrasing shows that they have powerful natural language processing abilities built into their system. Which pricing leads to higher profit for non-durable goods?